Artis Physio is a hospital based dialysis monitor which can offer a complete range of haemodialysis therapies. ... ultrafiltration system Exact water draining volume can be fixed. Easy maintenance Good accessability to the inside of the machine. Hemodialysis consists of filtering the blood by passing it through a circuit outside the body. 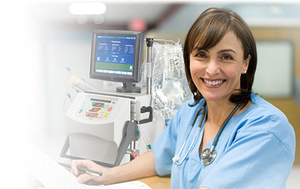 Thus, a hemodialysis machine automatically extracts, purifies and re-injects the blood. This filtration is by semipermeable membrane, with blood on one side and a dialysate consisting of purified water with potassium, calcium or other mineral additives in fixed concentration on the other. When the kidneys no longer effectively filter waste products from the blood, these machines take over the purification process to remove the buildup of various substances. Portable models enable patients to treat themselves at home. Hemodiafiltration models combine the diffusion process of dialysis with the convection activity of hemofiltration. Receive monthly updates on this section.